Le Grand Bornand is charming village from which to explore the alpine region - both winter and summer. Skiing with almost any type of health-related condition is possible thanks to some great ski instructors. The village is home to some high-class Internationally aclaimed skiers both down-hill and cross-country so it is in the blood! For the summer and other times of the year it has so much to offer and is very beautiful with a warm welcome guaranteed! Ski 2 Freedom Foundation has recommended Le Grand Bornand for skiers with Parkinson's Disease, those who are blind or visually impaired, have an amputation, autism, Down's Syndrome and other life-changing conditions. If you, a friend or family member have any of the following then Le Grand Bornand might work brilliantly for your ski or summer holiday. This is by no means an exhaustive list (it would be impossible to include every condition) but many have similar or common factors. As often someone may have a condition that we have not yet come across please do ask us if you are interested in the resort and we can try to help. 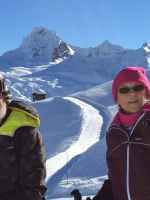 For more information on mountain activities in Le Grand Bornand please contact us. 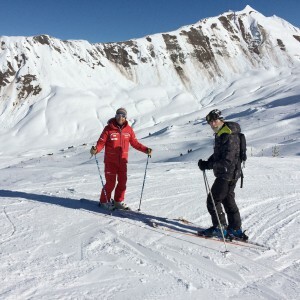 A fabulous ski school with some amazing ski instructors. We have used them for beneficiaries with Parkinson's Disease; blind and visually impaired; paraplegic; autism....... Do ensure you give as much detailed information as possible but otherwise contact us beforehand. They also have an instructor with experience of some one with a tracheostomy. We are delighted to work with and have the support of the following organisations in Le Grand Bornand. This lovely ski company operate year round but Paul Turnbull (the owner) has lived in the region for many years and knows everyone and everything! They have a central chalet-hotel in St Jean de Sixt but can make recommendations for Le Grand Bornand as well. Very welcoming and fantastic service. Highly recommended! 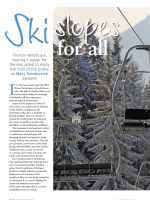 Many ski resorts offer reduced or discounted lift passes for someone with a disability or in need of assistance. For Le Grand Bornand the following apply. However we suggest you also contact the Lift Pass Office for further information as prices and conditions can change. All the news, feedback articles and press releases illustrate how Le Grand Bornand helps to enhance people’s lives. 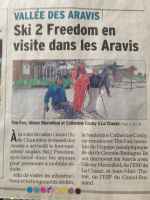 Also, in many cases, showing how Ski 2 Freedom works in close association with Le Grand Bornand to help raise awareness of the empowering benefits of mountain activities such as skiing and promoting accessible, social and inclusive tourism. If on reading our Le Grand Bornand page, you have your own experiences and feedback of the resort (winter or summer) that you would like to share or feel would be encouraging to others, please do not hesitate to send them to us for inclusion on both our website and social media – photos and film clips also welcome. For details see above - highly recommended by us.